Wildlife living in urban areas provide unique opportunities for residents. People can enjoy the opportunity to view wildlife from or near their property. Wild turkeys are one species that can adapt to the urban lifestyle, provided adequate resources for living are available. In a natural setting, wild turkeys feed on a wide variety of food items including insects, seeds, nuts, berries, buds, green leaves, small frogs, lizards, snakes, and much more. They generally travel in family groups or small flocks, consisting of 5-20 individuals. They forage for food by passing through an area picking at everything edible and even scratching to find food covered by leaves or grass. A flock of birds will quickly find most of the edible food in an area and move on to new areas in search of other forage. Flocks will roost in trees at varying locations throughout their home range. 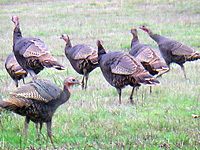 The typical wild turkey home range is several square miles.